What's going to happen? Tap the image to watch this 1:20 video. 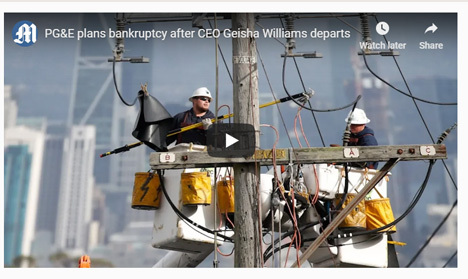 Pacific Gas & Electric (PG&E) — as you know — has filed for bankruptcy. Losses because of wildfires has put PG&E some $30 billion in the hole. That figure is expected to grow. So PG&E has filed for Chapter 11 bankruptcy. It turns out other utilities in California are facing the same fate. S&P Global Ratings has reduced the credit rating of the state’s two other utilities Sempra Energy and Edison International. That rating is so low it is almost junk status. Investors and other financial gurus worry that rating can even go lower. This has legislators and consumer advocates around the state worried. Inverse condemnation is the reason for the utility concern. It’s what PG&E has been battling in the California Legislature. The rule says a utility is responsible for all fire losses even if the company followed all the safety rules and the fire is more or less an act of God. He’s not alone in his worry. While PG&E didn’t prevail in the Legislature, when it came to inverse condemnation, it did have the support of former governor Jerry Brown and there are many in that body looking for a fix. A bill did pass last year that says utilities can pass losses onto ratepayers. In January of this year, Republican Assemblyman Chad Mayes put forth a bill that creates a California Wildfire Catastrophe Fund. Utilities — via fees — put dollars into the fund and that money will be used to back bonds. Proceeds from the bonds can be used to settle wildfire claims. Mayes said the details still need refining. Questions exist like how much of those costs can be passed onto consumers. However, the point — Mayes says — is to keep the lights on. “The idea is to pre-fund the disaster, not post-fund the disaster,” he said. California’s new governor, Gavin Newsom has put together an advisory panel with orders to put a solution on the fast-track. He wants something from the panel by July. Experts doubt anything it comes up will be much in the way of a solution because of the inverse condemnation rule. It is in California’s constitution so it will take a two-thirds positive vote in the Legislature to get it done away with. That said, utilities don’t want it gone, they just want — as Pizarro says — the rule applied differently and there is a precedent to do that from a 1997 water district case. What the utilities want is a less strict application. If a utility has acted in a reasonable manner then it ought not apply.